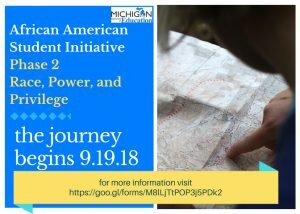 The Michigan Department of Education is launching Cohort 2, Phase 2 of The African American Student Initiative (TAASI): Race, Power, and Privilege. In the first of this six-session series, participants will explore the topic of Dismantling Systems of Oppression. Throughout the series, discussion will center on cultural proficiency, which is about learning to respect our own and other’s identities, celebrating cultural differences, mitigating marginalization, disparities, and disproportionality, while systemically integrating behavior that establishes standards for practice that promote cultural diversity, equity and inclusion. To share, dialogue, and learn with one another about our unique truths and perspectives about race, power, and privilege in schools and districts. For more information, contact Dr. Theresa Saunders via email or at (517) 241-9566 or Dr. Jill Griffin via email or at (517) 335-3064.